Design and looks have always been an important feature of FujiFilm's line of compact cameras. Back in the 1990s it was one of the first brands to launch brushed aluminum compacts with large screens and easy controls. 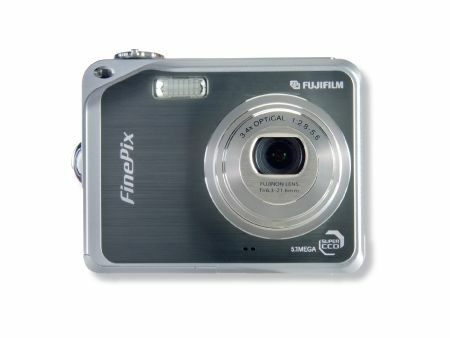 Fast forward to 2006 and this theme continues with the new 5Mp 3.4x optical zoom FinePix V10. FujiFilm dubs this the 'next-generation digital compact camera', placing heavy emphasis on design and looks in a nod to rival glamour compacts such as the Casio EXILIM range. The metal two-tone body is well built and reassuringly solid. Only a little bigger than a pack of playing cards, it lacks the curves of some ultra-compacts but boasts an almost perfectly square body that's about 1cm deep. Around the front, the 3.4x f2.8-f5.5 zoom folds like a concertina inside the camera body and benefits from a built-in electronic lens cap. Apart from the stylish design and gleaming metal finish, the domineering visual attribute of the V10 is the 3-inch, high-resolution 230,000-pixel, LCD screen, which takes up the entire back of the camera. As there's no optical viewfinder, shots must be composed and reviewed by this display alone. This, unfortunately reveals a couple of important design faults. For instance, the screen covers the entire back casing of the camera so there's nowhere for your thumbs and fingers to rest other than the screen, leaving it prone to greasy marks and scratches. Indeed, to get a full view when composing a shot, the camera must be held awkwardly on the sides. While this isn't a complete disaster, it does make handling a tad clunky. The other flaw with relying entirely on the LCD is the problem of glare, making it almost impossible to see subjects clearly in very bright conditions. Under the bonnet, FujiFilm has fitted a 5.1Mp Super CCD HR sensor which, combined with the camera's new Real Photo Technology, gives an impressive ISO1600 for low light conditions and a low sensitivity setting of ISO64 for shooting in bright daylight. The ability to push the ISO up to 1600 is the basis behind the new Natural Light mode designed to be used in situations when flash might be unsuitable or undesirable. The Natural Light and With Flash shooting mode shoots two images in succession, one with and the other without flash, allowing you to choose the best result for the effect you want. The V10 is essentially a point-and-shoot camera. Although it does sport a manual shooting mode, this is limited to controlling exposure compensation, white balance, and auto focus modes. There are also four scene modes for Portrait, Landscape, Sport and Night as well as an Auto setting. Switching between modes is clumsy and somewhat time-consuming with a fiddly trip to the camera's menu system rather than selecting exposure settings via a mode dial. A FinePix button on the top of the camera reveals more control over image size, ISO and colour modes with the ability to capture in mono and chrome modes - the latter is designed to emulate the super-saturated colours of Fuji slide film. This camera functions as both electronic jewelry and a pocket snapper. These features are underlined further still with the revelation that no less than four retro arcade computer games are also packed into the svelte body, allowing you to turn thumb bandit when you run out of subjects to snap. The benefit of the large screen makes the V10 feel more like a games console than a camera when in this mode, and for those looking to while away any annoyingly unscheduled departure lounge delays, the V10 earns its keep as a capable compact camera and a handy entertainment system. For simple, uncomplicated picture taking, the V10 doesn't let you down. It's fast and responsive with very little shutter lag and a snappy start-up time. What's more, a flick of a switch on the side of the camera takes you to movie capture mode with the ability to record VGA footage at 30 frames per second with sound - ideal for capturing short home movies in addition to still photographs.